In order to answer the question who is better in mastering something, people calculate different ratings/metrics. The same thing applies to the Counter-Strike and players’ performance: everyone is familiar with such things as K:D, ADR, HLTV rating, etc now. However, I do believe there are tons of other useful metrics that are still not calculated by people: either by stream studios or HLTV (can’t be sure about private tools). Frankly speaking, I think that most of the currently published statistics are terrible: not informative, not diverse and everybody evaluates the same things. 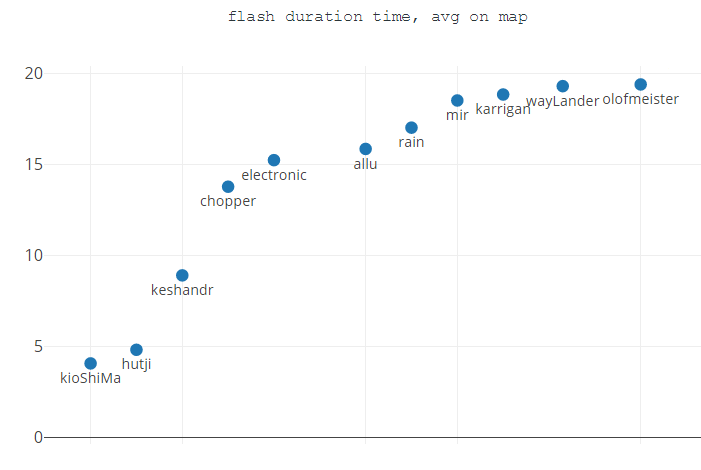 To illustrate the idea that there could be some other metrics rather than counting map overall frags and damage, I took all 47 current demos from the Krakow Major and made a program that calculates some metrics related to the flashbangs usage. All of the teams that got less than 200 seconds on average have a non-positive result. Again, 200 seconds per match seem to be a threshold between teams reaching play-offs and teams that didn’t. The better you flash, the better your final position is. All right, but just flashing is not enough to win. Another possible metric to count is flash-to-kill conversion. Flash kill here is a situation when a player flashed his opponent and the opponent got killed during the flash duration time + 0.5 seconds after. In that case the player who threw a flash gets +1 to the metric. So it really doesn’t matter who made the kill since the goal is to count flash-to-kill conversion. Once again we see a 12 flash-kills threshold there: just 1 of 8 teams in playoff! And who is that “anomaly”? Gambit. From my point of view it’s something pretty typical for the teams from CIS to not rely on flashbangs too much. There might be some other team metrics related to the flashbangs. However, let’s have a closer look at some of the players personal metrics. I used the following approach for all of them: first of all, I sorted all the values before making plots. This is made in order to see the distribution of values. Next goes a quick overview of the extreme values, took from both sides. Let’s see who's on top. Everyone with > 80 seconds on avg. The other side of the moon metric, everyone with < 20. The only one of them who got out of the groups is olofmeister. There may be many other metrics related to Counter-Strike. 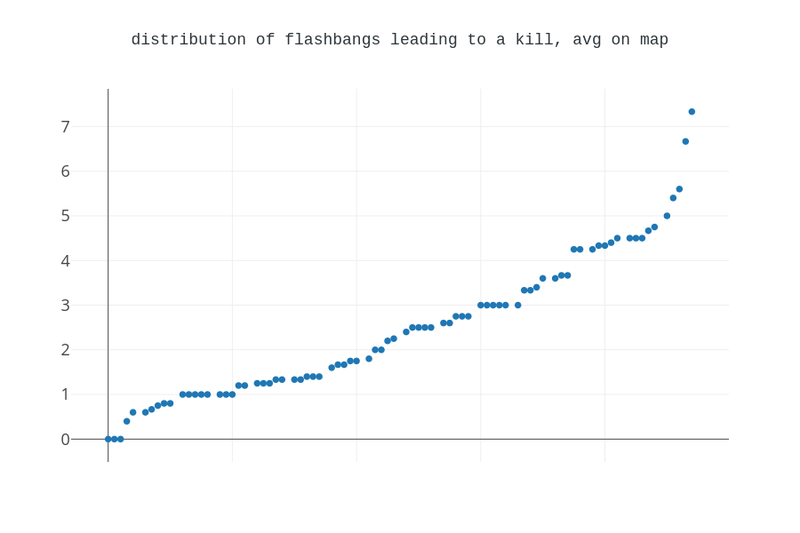 The goal of this post was to show people that there could be some other metrics, for example related to the flashbang usage. A few words about myself. My current job duties primarily include creating tools for CS pro-teams, but I am also interested in cooperation with the content creators and producers. Feel free to contact me at watti@gosu.ai if you have any thoughts on that topic.